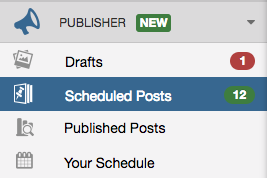 If you have been scheduling Posts and would like to mix them up, you can shuffle your queue to quickly re-arrange the Posts in your queue. Any unlocked Posts will shuffle, swapping places with other unlocked Posts in your queue and leaving open time slots and locked Posts intact and untouched. This will shuffle your entire queue, even if you are only viewing a subset of Posts at once. Helpful Tip: Shuffling will NOT move scheduled Posts into any empty time slots. 2. Click the Shuffle Queue button (located above "Your Schedule"). 3. To Confirm shuffling click, "Yes, Shuffle My Queue". Note: This action cannot be undone, so we ask you to make sure!